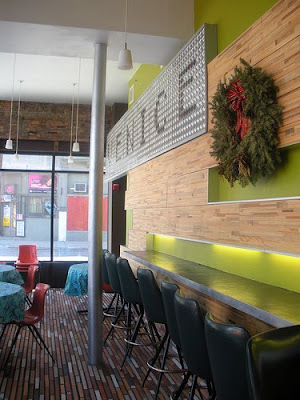 Over-the-Rhine’s Venice on Vine is not only a great place to grab a bite to eat, but it’s also an employment education program of Power Inspires Progress, and on May 8th you can help raise money for the cause while enjoying an all you can eat buffet for just $15. The Pizza Party will take place from 5pm to 9pm this Friday, May 8th at the Venice on Vine Pizza Parlor (GoogleMap). The event is labeled as “BYOB” and will also have live music. If you’re unable to attend, but would still like to make a contribution then you can make a donation to Power Inspires Progress (PIP) by mailing it to 1301 Vine Street, Cincinnati, OH 45202. Donations are tax deductible and will benefit PIP’s employment education program. It is also worth noting that Venice on Vine has made several notable improvements to their Vine Street location recently that include new tile work, signage and window decals. The improvements definitely give the establishment a more permanent feel and add to the character of the neighborhood. Venice on Vine photo courtesy of Flickr user sarah.szurpicki.